Thorough weather checks are done prior to any trip. Should inclement weather prevent us from proceeding with the tour on any particular day, the client/s would be informed and the tour would be cancelled. Client/s can then either reschedule to another suitable date, or a refund would be given. Should the tour be rescheduled by the client, the second tour date would be fixed and firm and cancellation clause in this paragraph would be applicable. Transport costs are completely separate to the shark diving tour. Therefore, should clients and White Shark Ventures Pty (Ltd) team find themselves in Gansbaai already (based upon a good weather prediction) and sudden strong winds pick up preventing the boat from being put to sea, and to ensure the safety of our passengers, transport costs (irrespective of road or air) would be payable in full. Should strong winds pick up whilst out at sea and return to shore is required for the safety of passengers and crew, a refund will not be applicable. Once tour is confirmed, tour cancellation should take place at least 24 hours prior to tour departure time. Should the client cancel their tour less than 24 hours prior to tour departure time from Cape Town, 100% cancellation fee will be applicable. Should the client not arrive for their tour (“No Show”), 100% cancellation fee would be applicable. Credit card payments (VISA / MASTER / AMEX) are accepted at an additional 3.5% surcharge fee. Due to variable weather conditions and shark activity, diving may not always be possible and is therefore not guaranteed. Due to the fact that we are dealing with wild animals, shark sightings cannot be guaranteed (not from the boat, nor the cage). Refunds will therefore not be considered in the event of non-sightings from the boat or cage. Should it be reported by the captain of the boat that no sharks at all were spotted around the boat for the duration of the tour, this will be classified as a “miss” and guests on-board will then qualify for a voucher to join us on a second shark dive, free of charge. 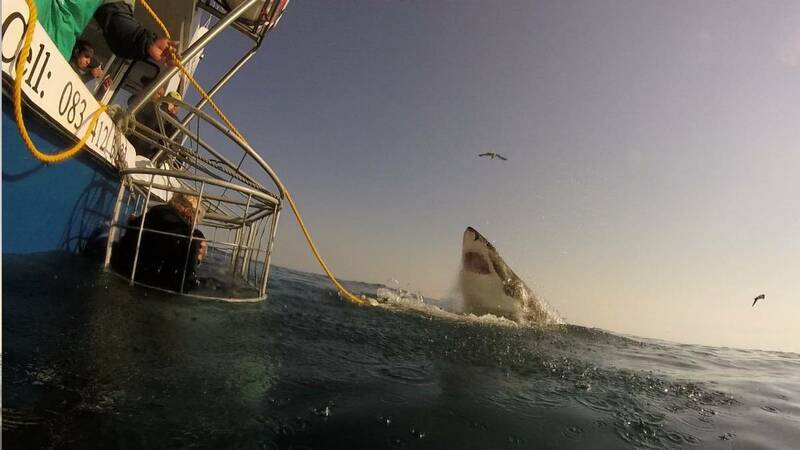 This will not be the case if we had sharks around the boat, but they were not seen from the cage. The captain’s decision on “non sightings” is final and free voucher are non-transferrable and excludes road transfers. White Shark Ventures Pty (Ltd) reserves the right to run more than one tour per day, each consisting of approx. 3 hours at sea. Time related itineraries and collection times are dependent on tides, weather conditions and the amount of tours we have scheduled. Exact collection times are therefore only available after 16h00 the day prior to the tour, and may vary between 04h00 and 11h30. White Shark Ventures (Pty) Ltd. reserves the right to use any photographs and/or video footage taken by any participants on this tour, for their own promotional, advertising and/or any other purposes. Any photographs and/or video footage taken on this tour may under no circumstances be sold or given to any broadcasting / media agencies for their use, without clear and written consent from the owners of White Shark Ventures (Pty) Ltd, failing which may result in legal action. The videography service we offer is that of a totally independent company and is not in any way connected or related to the company. White Shark Ventures (Pty) Ltd. is therefore not liable for any loss, damage, late or non-receipt of DVD’s, ordered or purchased from this company. Should you cancel your tour less than 24 hours prior to tour departure from Cape Town, a 100% cancellation fee would be applicable. Should you not arrive for the tour (“No Show”) 100% cancellation fee would be applicable. Should you wish to reschedule your tour, you need to give us 24 hours notice and we would be happy to accommodate you on a different date. No cancellation fee will apply in this case. Tour cancellation must take place in writing at least 7 working days prior to tour date. Should you cancel the tour less than 7 working days prior to tour date, 100% cancellation fee will be applicable.